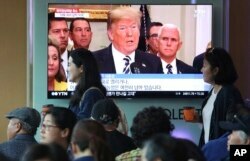 A man watches a TV screen showing file footage of President Trump, right, and North Korean leader Kim Jong Un at the Seoul Railway Station in Seoul, South Korea, May 16, 2018. Amid a flurry of rapidly evolving diplomatic activities aimed at reviving the summit between Washington and Pyongyang, experts contacted by VOA's Korean Service say that completely denuclearizing North Korea probably is unachievable. "I think it is very difficult to know if these negotiations will lead to North Korea giving up its nuclear weapons," said David Albright, a former U.N. nuclear inspector and nuclear proliferation analyst at the Institute for Science and International Security. "The problem is that North Korea entered into negotiations twice now where that was the goal but never really intended to accomplish that goal." Last week, President Donald Trump canceled the summit in a letter addressed to North Korean leader Kim Jong Un, citing Pyongyang's "tremendous anger" and "open hostility" toward Washington. Then North Korea's Vice Foreign Minister Kim Kye Gwan, a longtime nuclear negotiator and senior diplomat, said in a statement carried by state media that the North was willing to sit for talks with the U.S. "at any time in any format." Trump responded that talks regarding the summit scheduled to take place in Singapore on June 12 were "going very, very well." On Wednesday night, Kim Yong Chol, vice chairman of North Korea's ruling Workers' Party, met with U.S. Secretary of State Mike Pompeo. On Thursday, they are expected to discuss final details of denuclearization talks for the summit, which is now expected to take place as anticipated in June. Kim Yong Chol, center, former North Korean military intelligence chief and one of Kim Jong Un's closest aides, arrives to have dinner with U.S. Secretary of State Mike Pompeo, May 30, 2018, in New York. Against this diplomatic backdrop, VOA's Korean Service contacted 30 analysts, who unanimously said that Pyongyang will not yield to Washington's demand to abandon its nuclear weapons program completely. Here are some key comments from the experts. Douglas Paal, vice president for studies at the Carnegie Endowment for International Peace, thinks Pyongyang might agree in principle to give up its nuclear weapons and missiles at the summit talks with the U.S., but it could easily make excuses later and delay the process, especially if sanctions are relaxed. Trump's "maximum pressure" campaign has led international efforts to impose sanctions banning 90 percent of the North's trade. Howard Stoffer, who served as deputy director of U.N. counterterrorism committee, also said the North could agree to completely denuclearize at the summit but the differences between Washington and Pyongyang over the pace of denuclearization could hamper the talks. Stoffer speculated the negotiations could stall if Pyongyang insists on its "phased" approach and demands that Washington make concessions as it takes steps to denuclearize. "If they come in and say, 'No we are going to have to take something,' then I don't think there is going to be a negotiation," Stoffer said. Pyongyang has said it prefers a "phased and synchronized" process of taking incremental steps toward denuclearization, expecting those steps to be matched by certain concessions from the U.S.
People pass by a TV screen showing a footage of U.S. President Donald Trump during a news program at the Seoul Railway Station in Seoul, South Korea, May 25, 2018. Experts think Kim will most likely agree to give up a part of North Korea's program instead of all of it, which is what the U.S. is expected to ask. 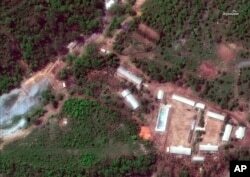 FILE - This May 23, 2018, satellite file image provided by DigitalGlobe, shows the Punggye-ri test site in North Korea. "We have all been through this experience before so it is very hard to take Kim Jong Un seriously," Samore said. "But the argument in [South] Korea is that he is different than his father and his grandfather, and he is very genuine about giving up its nuclear weapons in order for reform and to revive the economy. But as far as I can tell, that is not based on any evidence beyond Kim Jong Un's statements, which I don't think are very plausible." "We're moving forward, and we'll be prepared either way. And we're planning as if it is happening," she said.